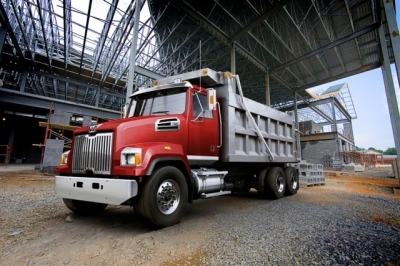 FORT MILL, S.C. â€“ May 8, 2012 â€“ Western Star Truck Sales, Inc. today announced the addition of a new 4700 tractor to its product lineup. Since successfully launching the 4700 truck in March 2011 to six targeted vocational segments, Western Star customers immediately recognized the potential of this truck as a tractor configuration. Featuring several fifth wheel options, the 4700 tractor provides the ideal solution for bulk haul, local delivery and construction applications. â€œThe response from our vocational customers has been overwhelmingly positive, and weâ€™re excited to expand our offering to new markets and customers that have been eager to experience the quality and customization of a Western Star,â€� said Guy Lemieux, marketing segment manager, Western Star. Available in a set-forward and set-back day cab configuration, the 4700 tractor incorporates a high visibility hood, and a wide variety of fifth wheel and wheelbase selections. The 4700 tractor also features one of the broadest power range offerings in a single truck model. From the lightweight and economical Cummins ISC and ISL engines, to the powerful and efficient Detroitâ„¢ DD13Â®, the 4700 features power ratings from 260 hp to 470 hp. Combined with several transmission offerings including the Allison automatic, Eaton manual, and Eaton UltraShiftÂ® PLUS, the 4700 tractor can be specâ€™d perfectly for many regional and bulk haul applications. In addition to the new tractor, the company also announced several new options for the 4700 product line. These include: Hendrickson and Watson Chalin lift axles: Several new lift axle solutions from Hendrickson and Watson Chalin increase the customization options for vocational applications. The benefits include varying weight savings, SPIF compliance, optimized packaging and added durability, to name a few. New roof fairings and side extenders: The addition of roof fairing and side extenders help to improve aerodynamic performance and maximize fuel efficiency. Chalmers Suspension: The durability of the Chalmers rubber spring suspension offers increased stability and traction for off-road applications, and lower maintenance costs on suspensions and other components such as tires. The 4700 tractor is now available to order. Please contact our Truck Sales Department at (410) 742-0400 ext. 28 for further information.